1. Heat a little olive oil in a frying pan. Once hot, add the onion, peppers and garlic, and fry for 8 minutes or until soft. 2. Stir in the spices and fry for a further 2 minutes. 3. Add the tomatoes and kidney beans into the frying pan, stir, then simmer for 30 minutes. Add in more water if needed. 4. Meanwhile, halve the avocados, remove the stones, then peel and discard the skin. 5. Season the chilli with salt as desired and stir in most of the coriander, leaving a few leaves for decoration. 6. 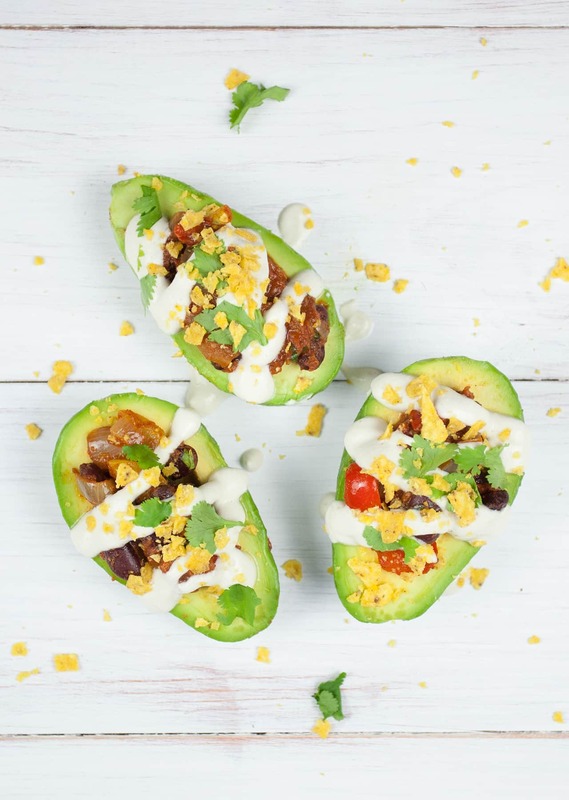 Fill the inside of the avocado halves with a tablespoon or two of the chilli mixture and top with vegan sour cream, then sprinkle with coriander and crushed tortilla chips. 1. Soak cashews in boiling water for one hour. 2. Drain cashews and place all ingredients in blender. Blitz until smooth. Everything kept falling off the Avocado so we mashed it up and put it in tortilla shells. Delicious!!! !